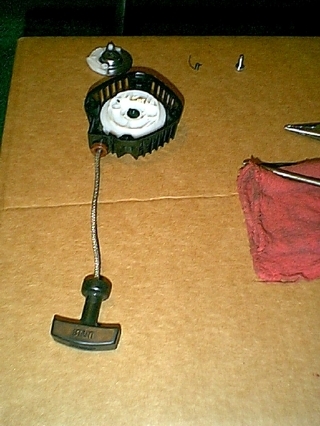 Cleaning the Pull Starter Housing. 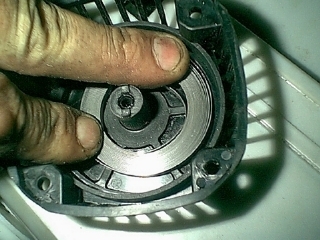 The steps below will take you thru a complete cleaning of the Pull Starter Housing. 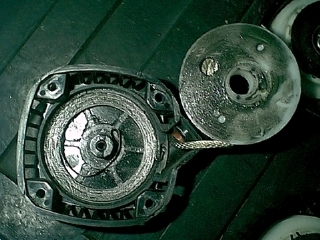 This is the second best way to maintain a trouble free starting system for your engine. The first way is to always have a spare and at the first sign of trouble. 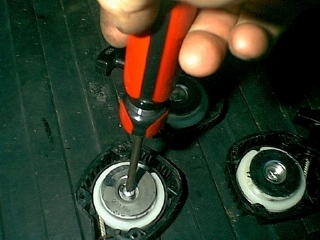 Replace it with the spare and when you get the chance give the one you remove a good cleaning and have it ready at your next sign of trouble. Lets start by saying Never spray anything in the starter. Doing this is a short term fix and will only add to your problem. If there is no time to replace the housing then a splash of something will get you by. Remember, Things that get wet attract dust and dust turns to mud. You will need three tools to do the job properly. 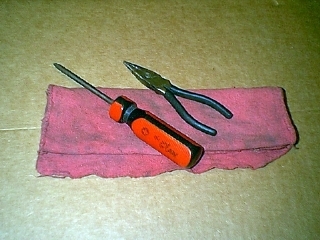 Needle nose pliers a clean dry rag and a #2 Phillips screw driver. 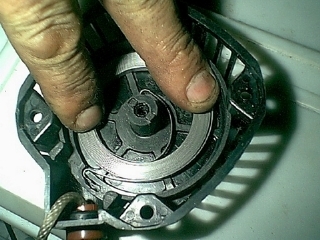 Take a good look at the starter paw and the springs on the starter. 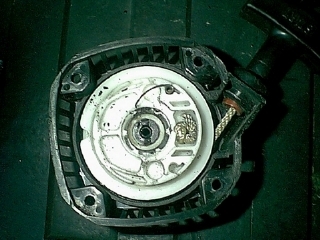 Remove the screw from the center of the starter unit. 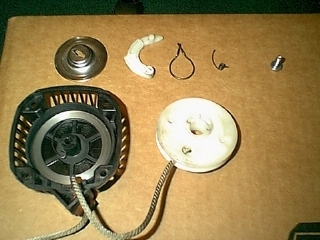 Note the parts and where they are located. After you do this once or twice it will be no problem for you. 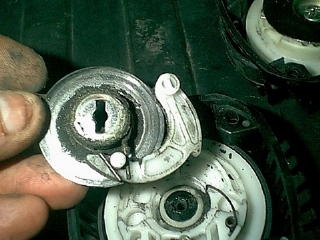 Pull the silver dished washer off slowly along with the starter drive paw (plastic part that catches the flywheel). Take a good look at how these parts fit together. Remove the engaging spring. 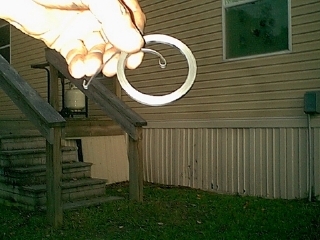 It's the wire spring that wraps around the dished washer. 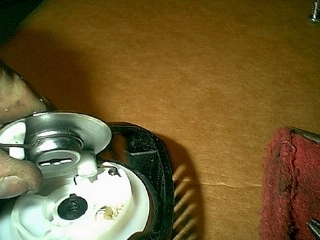 Then you will have a return spring which is a small wire with a spring coil on one end. Separate all these parts and clean them with the dry rag. 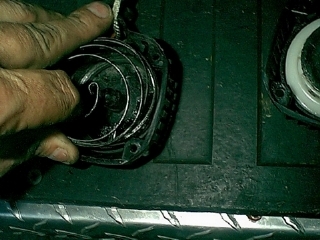 Then you have the rope pulley and a coil spring under it. 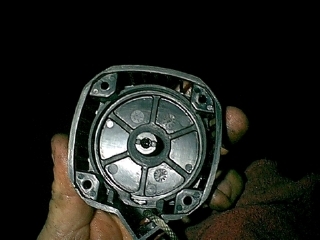 Take the needle nose and pull the rope pulley out of the housing. If the spring comes with it that's fine. If not you will need to pull the spring out. When pulling it out let it unwind. After it is cleaned I will show you how to coil it back up. Its only as hard as one makes it. 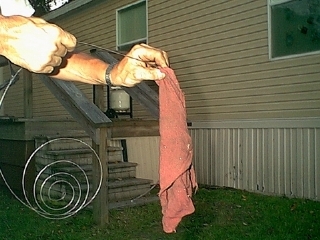 Take the dry rag and wipe the spring form one end to the other. Pull the spring thru your cloth covered finger and thumb cleaning both sides at the same time. Do this at least twice or until the spring is clean. Next clean the rope pulley, starter paw and the starter housing. 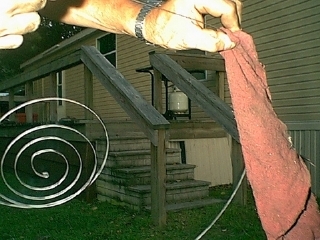 You can spray them with a plastic safe cleaner to make this job easier. Just remember, They MUST be DRY before you start putting things back together. Now with all parts clean and DRY. 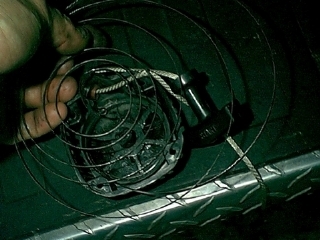 Start by coiling the large spring back into a small coil by rolling it into a tight coil and holding it near the center pull the coil tighter. 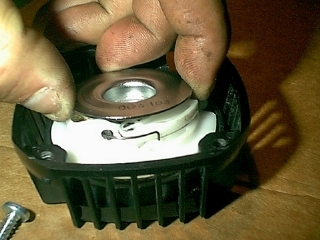 Do this until you have the OD of the coil smaller than the ID of the housing where it will be placed. Take a look inside the housing. You will see a grove. 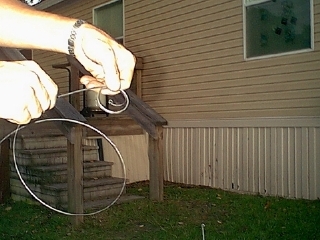 This is where you will place the loop on the coil. You can only wind the spring one way and there is only one way it will fit in the grove. 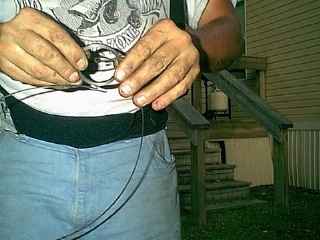 Now take the needle nose pliers and grab a good hold of spring coil near the outside end loop. Now you can place the coil in the housing and put the looped end into the grove. Press the spring down in place with your fingers to hold it in place as you ease off of your grip with the needle nose pliers; The spring should unwind in the housing as you ease off on the pressure of your fingers. Now look where the other end of the spring is. It should be about 1/16 to 3/32 of an inch away from the center part of the housing. 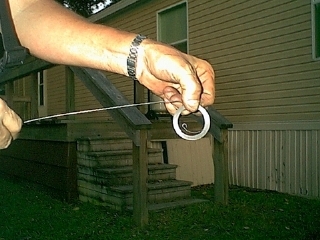 If not move (tweak) the coil until you have this distance. It won't take much at all to change its location. So a little pressure with your finger will go a long way. 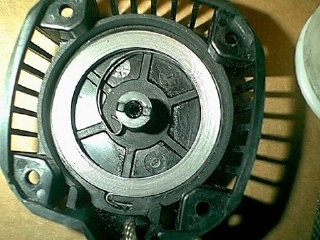 Now once you have the pulley over the spring. We need to add the other parts to the system. Yes, you will still have rope hanging from the unit. I will address this in the last step. Place the return wire/spring in the proper slot. You can tell where it goes by looking at the wear on the plastic. Place the starter paw against the return spring and push it over until you can drop the starter paw back in the hole it swings in. 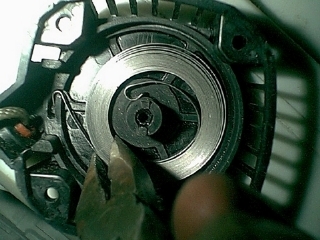 Now rotate the dished washer until the slot lines up with the small keys in the center. Now replace the center screw. Now pull on the starter rope a few times. It should be smooth. If any binding is felt. You will need to check all the parts for correct placement and fit. 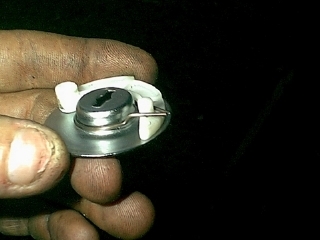 The most common problem is the return spring not riding on the outside of the paw or the engaging spring was placed on upside down. Now that things are free and working properly. Lets adjust the rope. 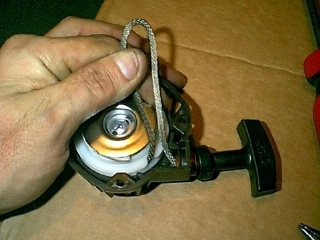 Pull the rope into the notch on the starter pulley and then rotate the pulley counter clockwise two full turns. Then pull the rope a few times. If the rope is still not retracting all the way. Repeat the last step going one more turn counter clockwise. Repeat this until the rope is adjusted. 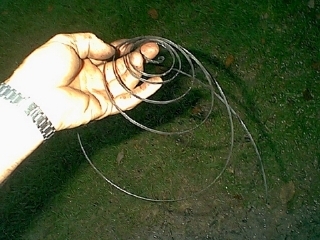 Don't get the spring to tight as this will shorten the spring life. It is always a good idea to have extra rope on hand. I use 29" for my starter ropes. You can follow the same steps for replacing a broke rope. 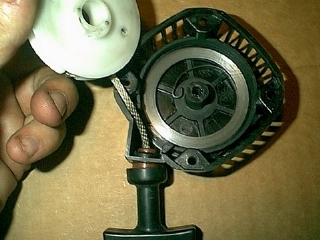 Its always a good idea to clean the starter completely if your replacing a broken rope. If you have the loop break off the recoil spring you can make a new loop by crafting a simple tool to form another loop. If you have tried making one with needle nose pliers and it kept breaking try this. Take 3/8's rod and make a slit in the center about 1/2" down the rod. You can use a 3/8's bolt with a long shoulder. Just cut the head and threads off of it. Then take a dremel tool and grind the sharp corner off the edge of the slit. Make the sharp corner round. Then to make a new loop. 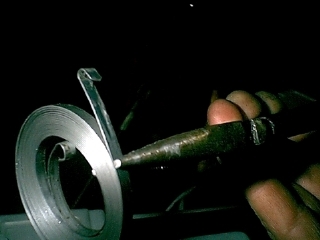 First round the end of the coil and then place it in the slit and as you turn the tool to bind the wire in the slit pull the wire to form a tight loop. The trick is to form the loop not to bend it. You can glue the rod in a block of hardwood and form a handle. If you need more info just ask, I will be happy to help.